The Spark 50mm f/5.6 Selective Focus Lens for Nikon F Mount from Lensbaby is a fun and affordable introduction to the world of Lensbaby optics and will set you on your way to experimental, creative and gorgeous selective focus photography. The Spark tilting lens body and selective focus optic makes images with a rounded area of focus with one "sweet" spot of ultra sharp focus surrounded by a gradually more and more blurred out-of-focus zone. The effect of this lens creates a dreamy feel with a unique sense of beauty that allows the viewer to really embrace the in-focus aspect of the photo, whether it be a person's eyes or hands or a flower's petal, and then to sense the gorgeously out-of-focus or dynamically motion-blurred background. The lens body is all-plastic making it very light but the lens itself is a multi-coated glass doublet: two coated lenses combined to reduce reflections and offer sharp focus. The aperture is fixed at f/5.6 and the prime focal length is 50mm, a great length for portraits and general photography. The lens is manual focusing only, which is actually ideal given that you should select your point of focus with precision, and the minimum focusing distance is 13". Compatible with all Lensbaby 37mm threaded accessory lenses and with the Lensbaby Optic Swap System, the Spark is a great way to start your foray into the creativity afforded by Lensbaby lenses and accessories. The Spark 50mm lens precisely focuses on one point within the frame creating a sweet spot of focus surrounded by gradual blur. The Spark's two optical elements are multi-coated to allow increased light transmission, contrast and reduce ghosting. The Spark can focus from a minimum of 13" to infinity. It is a 50mm lens with a fixed f/5.6 aperture. This Canon mount lens is compatible with all Lensbaby 37mm threaded accessory lenses and the Lensbaby Optic Swap System of interchangeable creative effect optics. 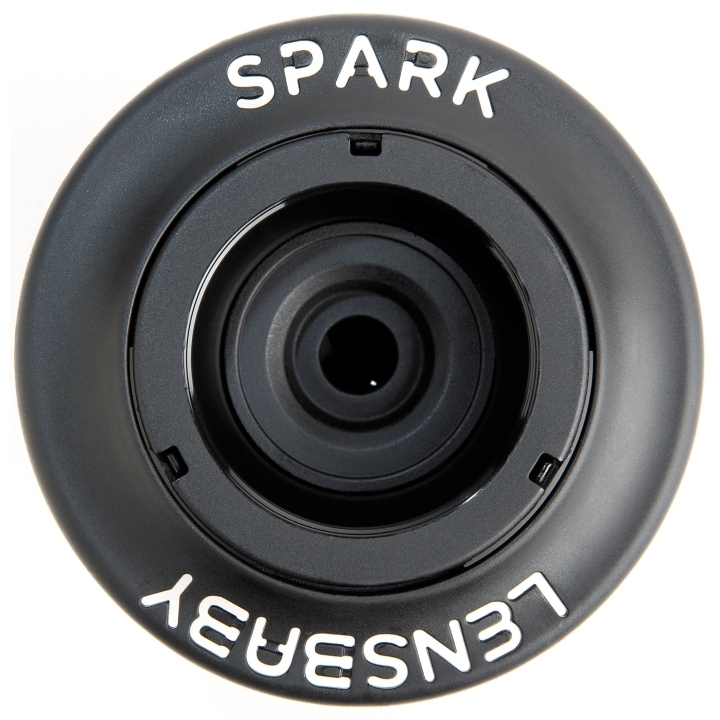 Spark lens focuses manually with a turn of the soft plastic body.